Summer is officially here, although that’s not something we need to tell you, as recent weeks have already had temperatures creeping up to the 90s. If you live through even one summer in the area, then you know you can’t get through the season with a malfunctioning air conditioning system. If your air conditioner begins to fail or even breaks down completely, then you and your family will be extremely uncomfortable and may even experience ill-health effects. Regular preventive maintenance from our professionals is essential to guarding your air conditioner from such problems. 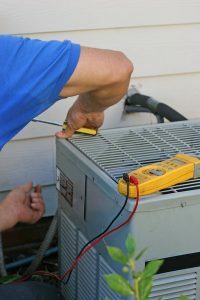 However, even with the best maintenance plan for an expertly installed system, no air conditioner is immune to problems. Watch for the signs we listed below to understand when it’s time to call for repairs. Is Your Air Conditioner Making One of These Sounds? As summer very quickly approaches, your air conditioner is about to enter its most stressful time of year. As it prepares to work hard to keep your home cool on a daily basis, it’s up to you to be watchful about possible AC issues that can crop up due to the added stress. One of the key indicators that something is likely amiss with your air conditioner is a strange noise coming from the system. Below, we’ve covered a couple sounds that should alert you that something is very wrong with your system, and you should call for repairs. You might hear the sound of hissing along with a bubbling noise. This is typically indicative of air bubbles which have formed in the refrigerant line. This is typically the result of a leak. Refrigerant leaks are nothing to take lightly, as they can cause the health of your entire air conditioner to start failing. Your air conditioner is supplied with enough refrigerant upon installation to last its entire life cycle, ideally. This refrigerant recycles throughout the system to move heat from one place to the other, and a leak will slowly drain your AC system of the fluid it needs to function correctly. Eventually this can cause your entire system to break down. Posted in Air Conditioning | Comments Off on Is Your Air Conditioner Making One of These Sounds? As the summer heat quickly approaches, you will soon be relying on your air conditioning system to effectively and efficiently cool down your home. This means that the strain on your AC system is going to increase, creating more of a likelihood that problems might occur. In order to keep you air conditioner in the best shape possible, you’ll want to not only invest in regular maintenance but also keep an eye out for symptoms of a system in disrepair. Keep reading to learn about a couple common air conditioning problems you might run into this summer.